Urban Mining is located in a huge converted factory building in Kansas City, Missouri, at 3111 Gillham Road. We were the first business to pioneer the "First Friday Vintage Market" concept in the Kansas City Metro, and we were at our previous location for over 12 years! Our recent move and expansion makes us among the largest vintage shopping venues in the metro area. We emphasize quality, authenticity and value in our inventory - making beautiful vintage treasures accessible to everyone. Urban Mining is committed to being a green business. Our inventory is hand-selected and hand-created, repurposed, recycled and renewed by an amazing team of more than 40 creative entrepreneurs, and each event is brand new, with fresh inventory at every monthly sale. Not only are we active in the local "green" community, supporting various green organizations throughout the metro, we operate as a green business, too. From our concept of recycled and reclaimed inventory to our recycled merchandise packaging and post-consumer recycling activities, to our unique business model that allows for decreased energy consumption throughout the month, we strive for environmental stewardship in everything we do. We are open only one four-day weekend each month, on the weekend with the first Friday of each month - see our "HOURS & DATES" section for details! This photo was taken in the 1930s when The Historic Meyer building was a Woolworth's store! Urban Mining is proud to promote these wonderful Green organizations in Kansas City! A Kansas City green energy demonstration house furnished by Urban Mining Homewares! 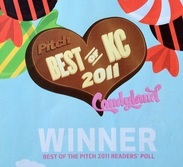 Urban Mining was recently voted Kansas City's Best Place to Shop Green by Pitch Magazine Readers!